New Recycled Office Supplies To Help Our Environment Now! Recycled office supplies in many paper categories have been around since the late 1980’s. Recycled copy paper, hanging folders, classification folders and notebooks all have been on the market for a couple of decades, and have gone a long way in helping to “reuse” the paper and corrugated items that people are actually recycling. Recently many new items, particularly plastic based office products, have come on the scene offering consumers green office supply choices that are kinder to our planet. The truth is more and more people are recycling today which is a great thing. The reality is for the recycling triangle to truly complete, people need buy products manufactured from recycled material, lest the recycled content sit in warehouses waiting for consumption. The good news is common office supplies used by small business to large corporations are now available to close that green triangle. I’ll show you several quality green office products alternatives you may not know about that will help you do your part. 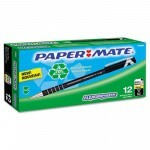 Paper Mate Recycled Flex Grip Pens are awesome pens, and made from 70% recycled material! Most everyone knows the recycled paper alternatives out there, but few know there are multiple choices for recycled pens to write on that paper. My favorite recycled pen is Paper Mate FlexGrip recycled ball point pens that come with a rubberized barrel for comfort and are smooth writing. The best part is these pens are made with 70% post consumer waste. Item PAP1749941 is a black ink medium ballpoint in a dozen pack box that is a great writing pen! The sales of bottled water are through the roof, and just think of all those plastic bottles that are being recycled. Those plastics are called PET, and some manufacturers in office supplies are using recycled PET to help reuse the recycled plastic waste. The next time you need a chair mat for your business or home office, consider a mat from Floortex called the RevolutionMat because it’s made using 100% recycled PET. What a great idea! Item FLRECO3648EP is a slightly tinted 36 x 48 inch chair mat designed for hard floors that is a great product, and good for the environment. Eco-Products uses recycled PET plastic from plastic bottles to help reuse all those water bottles! Another way to reuse all that PET is in something as simple as standard cold cups used by most people every day. Eco-Products is a company well known for high quality recycled products, and their cold cups are great for break rooms and special occasions. 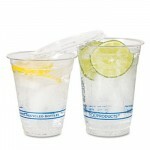 Made from 50% post consumer PET, these cups come in 50 packs, or cartons of 1000 for large needs. Item ECOEPCR16PK is a top seller in the popular 16 ounce size. View binders and other standard binders for the office are not the best on the environment because of the vinyl used in production. Thanks to a new company called ReBinder, you can now buy binders that are not only made from recycled materials, but that are also 100% recyclable! 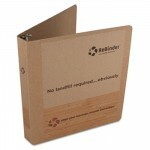 ReBinder's are new ring binders that are made from 70% recycled material, but most importantly are 100% recyclable! Called ReBinder Zero Waste Binders, these unique items are made from 70% recycled materials. When you are finished using the binders, you can easily remove the metals of the product and recycle them in the metal recycling area, and recycle the binder itself in the corrugate recycling area. Binders are available in sizes from 0.5″ rings to 4″ rings, and they are surprisingly durable. The best selling Rebinder is the 2″ ring which is item REBRBCRR20EA. These are just a handful of the many recycled and recyclable office products and janitorial supplies on the market today that really make a difference for our environment. While it is true these items typically cost a little more than their “non-recycled” counterparts, it is worth the extra expense now to ensure a healthy thriving planet for our children in the future. Do good work and buy recycled office supplies whenever possible! This entry was posted in Office Supplies and tagged Classification Folders, conscious capitalism, green office products, Office Supplies Online, Recycled Office Supplies, view binders, Zuma. Bookmark the permalink.